Application of zeolite membranes, films and coatings (F. Mizukami). Study of the influence of silica source on the properties of silicate solutions and the particulate properties of zeolite X (T. Antoni&cacute; et al.). A method for the preparation of silicalite-1 microspheres (L. Tosheva et al.). In situ crystallization of MFI-type zeolites over cordierite support (R. Aiello et al.). Particular features of the introduction of In into MCM-41 by reductive solid-state ion exchange (Y. Neinska et al.). Pore-size control of Al-MCM-41 materials by spontaneous swelling (I. Diaz et al.). Enhanced hydrothermal stability obtained for in situ synthesized micro- and mesoporous MFI/MCM-41 like phases (A. Karlsson et al.). Analysis of the influence of kinetic and chemical factors on the rate of crystal growth of zeolite A (S. Bosnar et al.). Factors controlling the coatings of a metal with zeolite Y (G. Clet et al.). Synthesis of ZSM-5 and A zeolites on porous alumina substrates (C. Caruso, A. Nastro). The stability of zeolite coatings grown on metal supports for heat pump applications (M. Tatlier, A. Erdem-&Scedil;enatalar). Preparation and characterization of TON type zeolite catalysts (F. Cosentino et al.). Crystal population balance model for nucleation and growth of colloidal TPA-silicalite-1 (D. Creaser). Zeolite synthesis using 1,6-diamonohexane-based organic diammonium salt as templates (M. Inaba, H. Hamada). The synthesis of small colloidal crystals of TPA-silicalite-1 with short synthesis times and high yields (Q. Li et al.). Synthesis of nanosized FAU-type zeolite (S. Mintova, V. Valtchev). Synthesis of VS-1 zeolite wetness impregnated SiO2-V2O5 xerogels (D.P. Serrano et al.). Analysis of distribution of nuclei in matrices of differently prepared and treated aluminosilicate gels (B. Suboti&cacute; et al.). Incorporation of iron in MFI structure in fluoride media (F. Testa et al.). Synthesis of thin zeolite Y films on polished &agr;-alumina wafers using a seeding technique (M. Lassinantti et al.). Preparation and permeation properties of different zeolite tubular membranes (E. Piera et al.). Spectroscopic and catalytic characterization of basic zeolites and related porous materials (U. Rymsa et al.). 2D multiple quantum 27Al NMR and 29Si NMR characterization of levyne (P. Lentz et al.). Valency and coordination of iron in FeAlPO molecular sieves: an in situ Mössbauer study (K. Lázár, J. &Ccaron;ejka). A vibrational spectroscopic study of the growth of silicalite-1 films on seeded gold surfaces (B. Mihailova et al.). 15N-NMR characterization and quantitative NMR determination of nitrogen adsorbed in MX zeolites (A. Fonseca et al.). Grafting on nitroxyl (TEMPO) radical on the surface of silica gel and micelle-templated silica (MTS) (D. Brunel et al.). Spectroscopic investigations of the decomposition of CCl2F2 on three different types of zeolites (I. Hannus et al.). Behaviour of benzene molecules in large pore zeolite structures as studied by FTIR and 2H NMR techniques (V. Norberg et al.). Ground and excited states of vanadium incorporated in inorganic matrices (M. Ignatovych et al.). Chemisorption of hydrogen on Ag-Y studied by 1H MAS NMR (T. Baba et al.). 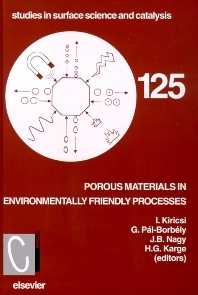 Free volumes in zeolites as probed by positrons (G. Duplâtre et al.). Study of electrostatic properties in three model sodalites: a different perspective on Brønsted acidity and host-guest interactions in zeolite cages (E. Fois et al.). Photoluminescent (PL) investigation on mesoporous molecular sieve materials (N-Y. He et al.). Site preference and reducibility of substituted ferric iron in Fe-ETS-10 (K. Lázár et al.). Acidity investigations and determination of integrated molar extinction coefficients for infrared absorption bands of ammonia adsorbed on acidic sites of MCM-41 (A. Taouli et al.). Calorimetric studies of ion-exchange equilibria on clinoptilolite involving unicharged cations (Y.I. Tarasevich, V.E. Polyakov). Investigation of liquid crystals in porous materials (H.-L. Zubowa et al.). Layered double hydroxides as solid base catalysts and catalyst precursors (D. Tichit, F. Fajula). Pre-stationary stage in ethylbenzene disproportionation over zeolite catalysts (N. Arsenova-Härtel et al.). The effect of zeolite structure on the disproportionation of trimethylbenzenes to xylenes and tetramethylbenzenes (J. &Ccaron;ejka et al.). Effects of ceria-modification of H-mordenite on the isopropylation of naphthalene and biphenyl (Y. Sugi et al.). Cesium-modified mesoporous molecular sieves as basic catalysts for Knoevenagel condensations (S. Ernst et al.). The hydroconversion of n-heptane over reduced and oxidized Pt/H-zeolite catalysts (J. Valyon et al.). Skeletal isomerisation of 1-butene over ferrierites dealuminated in solid state with crystalline (NH4)2[SiF6] (G. Pál-Borbély, H.K. Beyer). Ring-opening and dimerization reactions of methyl-substituted oxiranes on HZSM-5 zeolite (A. Fási et al.). Production of environmentally friendly octane booster (methyl-t-butylether, MTBE) using zeolite catalysts (A.K. Aboul-Gheit et al.). Cyclohexanol conversion as a test reaction for acid properties of solids - investigation of faujasites, mordenites and MCM-41 (J. Datka et al.). Benzene saturating isomerization (J. Hancsók et al.). Hydroisomerisation of n-heptane over palladium loaded SAPO-11 molecular sieves with varying concentration of acid sites (M. Höchtl et al.). Reactions of methylcyclohexane over bifunctional zeolite catalysts (A. Raichle et al.). Effect of pre-treatment of Zn-loaded ZSM-5 zeolites in reductive and oxidative atmosphere on the n-hexane aromatization (E. Rojasová et al.). Catalytic cracking of n-butane over rare earth-loaded HZSM-5 catalysts (K. Wakui et al.). Effect of trivalent elements in the framework on the basicity of zeolites (C. Yang et al.). MCM-41 supported TEMPO as an environmentally friendly catalyst in alcohol oxidation (M.J. Verhoef et al.). New transition metal-containing molecular sieves for selective liquid phase oxidation (L. Nemeth et al.). Conversion of polyethylene into aromatic hydrocarbons using MEL and BEA zeolites (O.A. Anunziata, L.B. Pierella). Oxidative methylation of toluene with methane over alkali modified X zeolite catalysts (K. Arishtirova et al.). Stability and deactivation of Ru/NaY and Ru-Co/NaY catalysts in CO hydrogenation (G. Stefler et al.). Selective nitration of toluene with acetyl nitrate and zeolites (D. Vassena et al.). Synthesis of 3-methyl-3-butene-1-ol from isobutene and formaldehyde on FeMCM-22 zeolites (T. Yashima et al.). Homogeneous and heterogeneous asymmetric reactions. Part 13. Clay-supported noble metal catalysts in enentioselective hydrogenations (B. Török et al.). Synthesis, characterization and catalytic activity of selective oxidation zeolite catalysts (O.A. Anunziata et al.). MCM-41 (M. Sugioka et al.). Chemoselective hydrogenation of the C=O group in unsaturated aldehydes over clay-supported platinum catalysts (Gy. Szöllösi et al.). Selective synthesis of lactones over Ru-Sn-Al2O3 catalysts prepared by complexing agent-assisted sol-gel method (M. Toba et al.). The adsorption and catalytic properties of Cu-ETS and Cu-ZSM molecular sieves in NOx removal by reduction (A. Auroux et al.). Selective catalytic reduction of NO with methane or ethene on ferrierite- and mordenite-type zeolites containing copper, cobalt and indium (J. Janas et al.). Catalytic properties of Pt and tungstophosphoric acid supported on MCM-41 for the reduction of NOx in the presence of water vapor (A. Jentys et al.). Nitrous oxide decomposition over iron-exchanged [Al]- and [Fe]-ZSM-22 zeolites (M. Kasture et al.). Selective reduction of nitric oxide by methane over Pd-exchanged H-ZSM-5: influence of activation (B. Pommier, P. Gélin). Characteristics of V2O5/Ti-PILC catalyst for reduction of NO by NH3 (H.J. Chae et al.). Sorption of CO and N2 in CuZSM-5 studied by IR spectroscopy (E. Broclawik et al.). Role of carbonaceous deposits and effect of temperature swing reaction (TSR) in selective catalytic reduction of nitric oxide over Ru-HZSM-5 catalyst (J.Y. Bae, W.Y. Lee). Different methods for preparation of Fe-ZSM5 as catalyst for the selective catalytic reduction of nitrogen oxides (P. Marturano et al.). On the role of acid site in NOx decomposition over Pt/ZSM-5 and Pt-Co/ZSM-5 catalysts (Z. Schay et al.). NO adsorption and decomposition on Cu-containing mesoporous molecular sieves - comparison with Cu-ZSM-5 (M. Ziolek et al.). Natural zeolites in environmentally friendly processes and applications (C. Colella). Breakthrough study of SO2 and H2O adsorption on zeolites from ternary mixtures (M. Mello, M. Ei&cacute;). Sorption thermodynamics of nitrogen and oxygen on CaA zeolite (D. Shen et al.). Sorption properties and search for correlations between analytical parameters of sorption and content of metal in MeAPO-5 containing V or Zr (J. Kornatowski et al.). Use of dealuminated faujasite Y and ZSM-5 zeolites for VOC's adsorption. Applicaton of air cleaning (B. Garrot et al.). The possible usage of mesoporous molecular sieves for deodorization (M. Ziolek et al.). Wastewater treatment with natural clinoptilolite: a new additive (D. Kalló, J. Papp). Zeolite content and cation exchange capacity of zeolite-rich rocks (A.F. Gualtieri et al.). Natural zeolites of Georgia: occurrences, properties, and application (G.V. Tsitsishvili et al.). Chromium removal from water by ion exchange using zeolites and solidification of the resulting sludge in a cement matrix (D. Caputo et al.). Application of clinoptilolite as an additive for the photostabilization of the Bacillus thuringiensis formulation (M. Kvanchantiradze et al.). Characterization and utilization of MFI zeolites and MCM-41 materials for gaseous pollutant adsorption (J.P. Bellat et al.). Kinetics of continuous exchange of Zn2+ ions from solutions with Na+ ions from thin layers of zeolite A (B. Biškup, B. Suboti&cacute;). Zeolite matrices for pigments (S. Kowalak et al.). Monitoring of hydrolysis in natural zeolite-H2O system by means of pH and electrical conductivity measurements (J. Peri&cacute; et al.). Sorption of transient metal ions into clinoptilolite from waste water and recycling the used zeolite into a composite fertilizer (R. Pode et al.). Potential use of MCM-41 for adsorptive separation of methylalumoxane (T. Sano et al.). Removal and recovery of harmful compounds from waste water of photographic processes by synthetic zeolite-Y (A.G. Vlessidis et al.). Destruction of chlorobenzenes by catalytic oxidation over transition metal containing ZSM-5 and y-zeolites (J. Halász et al.). Skeletal isomerization of n-butenes to isobutylene on ferrierite and H-ZSM-5 catalysts (D. Rutenbeck, H. Papp). To leave our planet liveable in the next millennium mankind is forced to find environmentally friendly ways in solving the problems of everyday life. Among others, technologies of producing chemicals, absolutely necessary for maintaining a comfortable life, have to be modified, in some instances fundamentally changed now, or in the very near future. Developing new technologies requires strong and innovative fundamental research. In order to provide opportunity for crossfertilization the Federation of European Zeolite Associations (FEZA) decided to organise a conference, where researchers from academia as well as industry can meet, exchange ideas, show and discuss research efforts and results concerning the development of environmentally friendly processes and technologies. The conference, and thus the proceedings are divided into two main parts. The first part contains works concerning the synthesis, modification and characterisation of zeolitic materials as catalyst candidates in environmentally friendly technologies. Works in the second part describe various applications starting from developing highly selective reactions for the fine chemical industry, through waste-water treatment to applying zeolite for formulating bacteria for pest control. For chemists and environmentalists concerned with research into production of environmentally friendly processes and technologies.